All International Medcom, Inc. instruments are factory-tested and electronically calibrated using proprietary processes developed over 40 years. Each instrument is shipped with a Certificate of Conformance certifying that the instrument has been tested and electronically calibrated to satisfy our rigorous quality standards. Qal-Tek Associates is an accredited laboratory that offers ISO 17025 NIST calibrations (National Institute of Standards and Technology) and the highest level of repairs. Calibrations are available for the Radalert® 100X, IMI Inspector Alert™ V2, and the Inspector EXP. Older model instruments such as, the Radalert® 50 and the IMI Inspector™ can also be calibrated. The cost for Radalert® 50 and the Radalert® 100 and Radalert® 100X for domestic (USA) customers is $85.00 per instrument plus $40 for shipping and handling between our facility and the NIST calibration facility, plus the return shipping cost to you. Within the U.S. this is typically $18.00 by Fedex Ground. Faster methods are available at additional cost. The cost for IMI Inspector™, IMI Inspector Alert™, IMI Inspector Alert™ V2, Inspector EXP, Inspector XP, Inspector BLE and Onyx is $105.00 plus $40.00 shipping and handling plus the return shipping cost. For International Customers the Inspector and Onyx class instruments are $115 plus shipping and handling costs described above. For the Radalert and Digilert family of instruments the international fee is $95.00 plus the shipping and handling fees described above. Please contact us directly for a quotation. If you are ordering a new instrument for an agency or medical facility that requires NIST calibration for compliance with applicable state and/or federal regulations, please let us know at the time that you place your order. 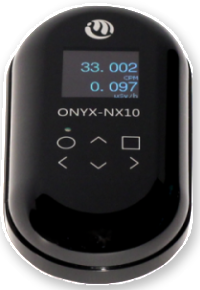 The NIST calibration will cost an additional $125.00 for the Radalert® 100X and $145.00 for the IMI Inspector Alert™ V2 and Onyx NX-10 (freight to and from the lab included). If your instrument does not seem to operate properly, please review the Troubleshooting section of the operating manual. If you continue to experience problems with your instrument, or have questions about its functioning, please call us at 707-823-0336 or send us an email via our Contact Form. Contact IMI right away if you receive a unit that is damaged in shipping. It is very important to keep all packaging material in the state as it was received. We need to contact the shipping carrier and file a claim. If the unit you received has stopped working, contact us right away and we will issue an RMA (Return Manufacture Authorization number). If your unit is still under warranty, contact us for an RMA number. For Onyx® Kickstarter X instrument repairs, please contact us directly at (707) 823-0336 or by email via our Contact Form. For non-warranty repairs, the customer is responsible for the cost of shipping the instrument to and from our repair facility. For warranty services, the customer is responsible for the cost of shipping the instrument to our repair facility, and IMI assumes responsibility for the cost of shipping the instrument back to the customer via our standard method of shipment. We will not, under any circumstances, accept for service at our facilities any instrument that has been contaminated by radioactive materials. Contaminated instruments will be disposed of in accordance with our local, state, and federal regulations. The instrument owner will be charged for the cost of such disposal and will not be recompensed for the loss of the instrument. If your instrument is used in a facility where it may come in contact with radioactive materials, please scan your instrument with a second detector to insure that you do not send a contaminated instrument to our facilities. If your instrument is contaminated and you would like have your instrument decontaminated or disposed of properly, please contact Qal-Tek Associates directly to obtain proper procedures on how to ship your instrument to them. They charge $120.00/hr for decontamination and their disposal fee varies depending on the severity of your instrument(s).